I went to the Los Angeles Art Show Saturday evening. 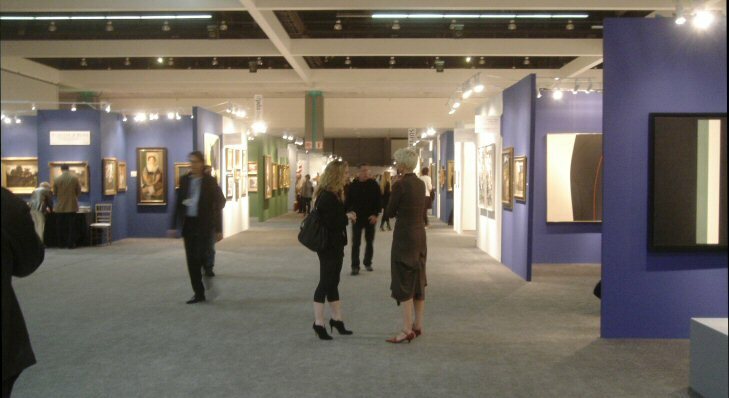 This is the main art fair in Los Angeles. Kind of like the art fairs in Miami, only much much smaller. It’s only one venue (well, two if you count ArtLA, but I don’t), instead of a dozen (ish). But what the heck, this is what we got. So I went. And I enjoyed it immensely. The show ran from 11am to 8pm on Saturday, so to avoid crowds I showed up just past 6pm, 2 hours before closing. I didn’t have the show entirely to myself, but it was pretty quiet, just the way I like it. The dealers naturally weren’t so gleeful about the lack of bodies. But they did admit that Saturday afternoon had seen a good crowd. The weekdays on the other hand were quite light. I don’t know why they even hold the show on so many weekdays. I can see opening the show on Friday, or maybe even Thursday, but the show actually opened on Wednesday. Doesn’t make sense to me. How many people are going to take a Wednesday off to tramp downtown for a single art show? Well, anyway. I took some pictures. I was a bit hampered by the low level of ambient light, and my not always perfectly steady hand. Obviously I couldn’t take flash pictures, so I had to hold the camera reeeeealy steady. A few pictures, alas, were too blurred to post. I’ll show you the ones that passed muster. There were more galleries this year. The space where the show was held, the Los Angeles Convention Center, is a much larger space than the Barker Hanger (Santa Monica) where it was held last year. Oddly, there were still places that felt a little crowded, but mostly it flowed nicely. 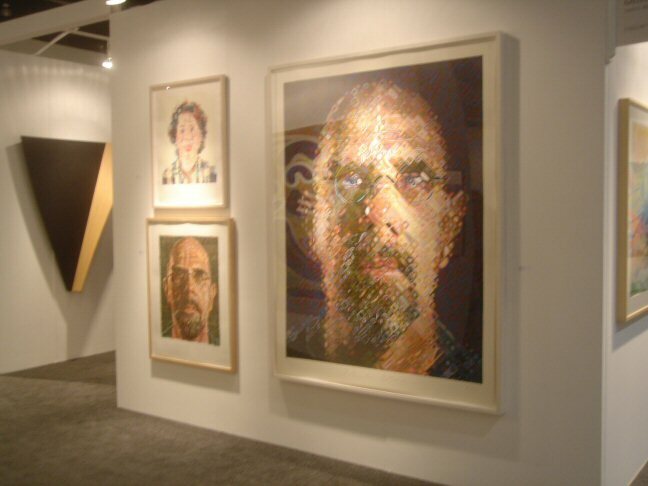 Chuck Close was a big phenomenon this year. I saw prints of his work in at least three galleries. One particular print was even available in all three! (I suppose you could’ve done some comparison shopping.) It made me mutter “Chuck Close overdose”. Don’t get me wrong, I love his work. But really people, let’s branch out a little, eh? Lynne Mapp Drexler, “Gotterdammerung”, 1959, oil on canvas. I’m unsure of the dimensions, but it’s something like 76×81″. Priced in the mid 5-figures, but I’m afraid I didn’t get the name of the gallery. Sorry. Another painting that caught my eye was this one by Chris Pousette-Dart. Looking up his work on the web, it seems that although he does a lot of abstract work, not all of it is as expressionist as this. Anyway, I really liked this particular piece. 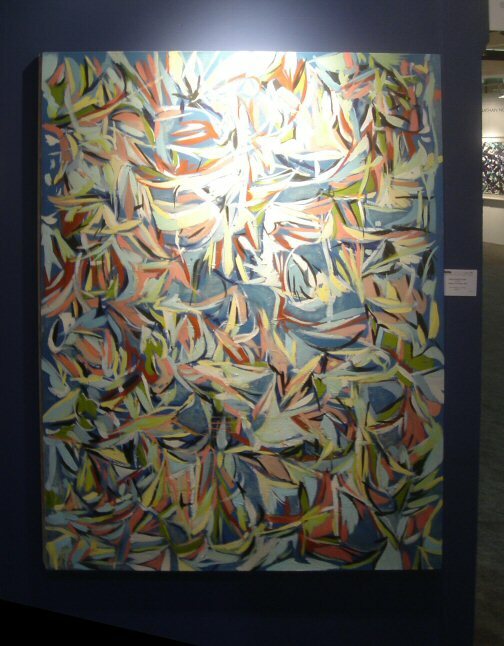 Chris Pousette-Dart, “A Night in November”, 2008, oil on canvas, 56×42. Affordably priced at $5800, available through the Rehs Contemporary Gallery of New York. 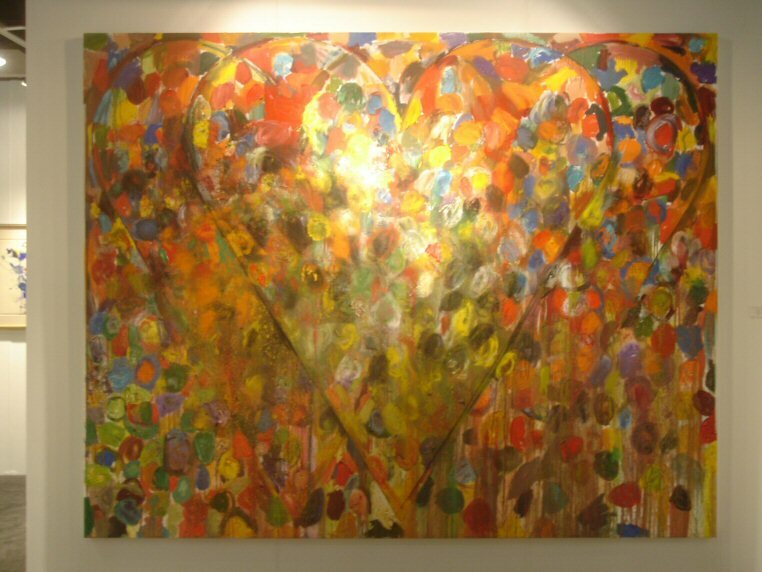 Another big painting that grabbed my attention was this enormous one by Jim Dine. Normally I shy away from anything with hearts in it, but the colorful expressionism overrode my anti-heart prejudice. Jim Dine, “Marathon Talks”, 2008, oil, acrylic, charcoal and sand on linen, 96×120″. $350,000 from the Jonathan Novak Contemporary Art Gallery in Los Angeles. Well, it is a big painting, and I guess the guy is pretty famous, but still… yikes. Speaking of famous, here’s another piece that caught my eye. The interesting thing is, I think it’s the same one that is shown here as having been auctioned off through Christie’s. So it’s been changing hands quite a bit, apparently (and it’s only dated 2000). 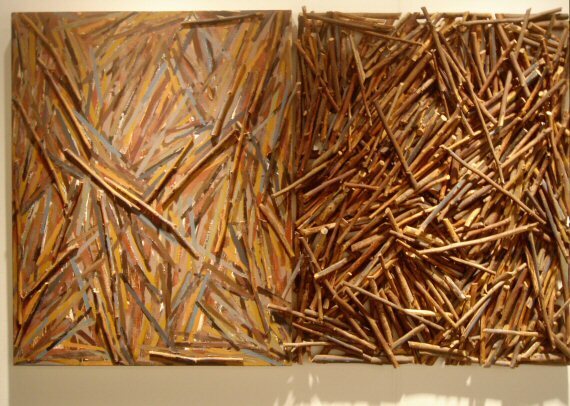 Diptych (no title) by Charles Arnoldi, 2000, oil and wood on canvas. My photo shows the texture better, but the Christie’s photo shows the colors better. Walking past this booth, I realized I’d seen these paintings before (well, images of them online that is). 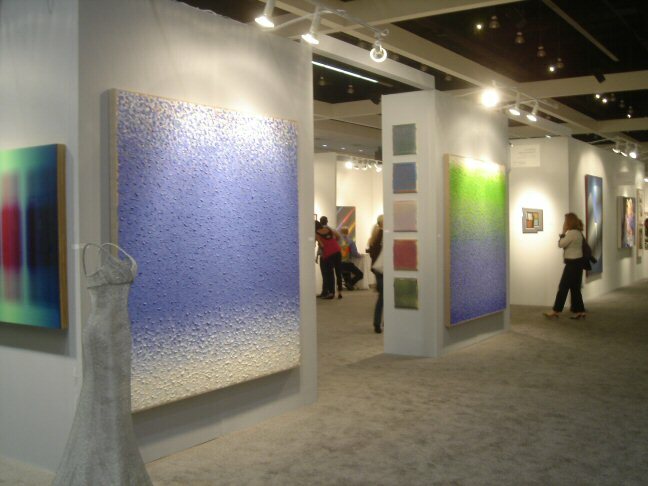 The two large paintings facing out are by Kuno Gonschior, a contemporary abstract pointillist artist pointed out to me by tackad, who blogs about art and artists he likes (including abstract pointillism). There was a lot of Chinese and Korean art in the show. By and large, the Chinese art was not to my taste. It was raw and highly political, and that stuff just doesn’t do it for me. Felt a bit too art-school to me, like the kids who have more raw energy and enthusiasm than subtlety and craft. The Korean art was all over the map, stylistically and content-wise. Most wasn’t interesting to me, but it was all well executed. One Korean artist, however, stood out for me. The originality of the material and the exceptional craftsmanship drew me in, and I had to take a good long look. When I asked the gallerista if I might take a photo, she said yes, then unnecessarily added that I mustn’t use flash. I agreed, of course, but this is a little silly in this particular case because the material isn’t photo-sensitive like paint. It’s wire screen mesh, like what you use in your windows to keep bugs out of your house. And yet the details the artist captured with this humble material were incredible. 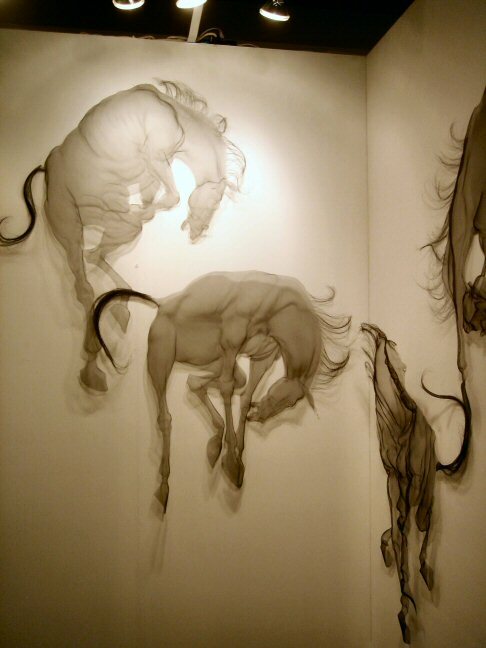 Horse wall sculptures made from windowscreen by Sung-Tae Park. Each was about 4 or 5 feet tall, but only an inch or so deep. You can get an idea of the detailing of the muscles from the two horses on the left side. On the right you can see two more horses almost edge-on. I was utterly captivated. This is original art! I loved how it spoke to the ancient tradition of asian ink painting with its traditional subject matter and monochromatic palette, yet brings the tradition up to date with the modern materials. After walking through the whole show, the one booth I wanted to revisit was the LewAllen Gallery from Santa Fe, New Mexico. 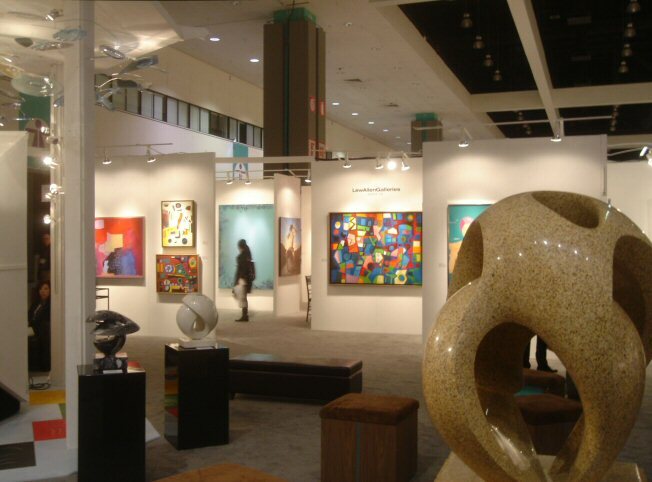 Sculpture in the foreground, and across the hall you can see the LewAllen Gallery’s booth (it’s the brightly colored paintings you see in the middle of the photo). 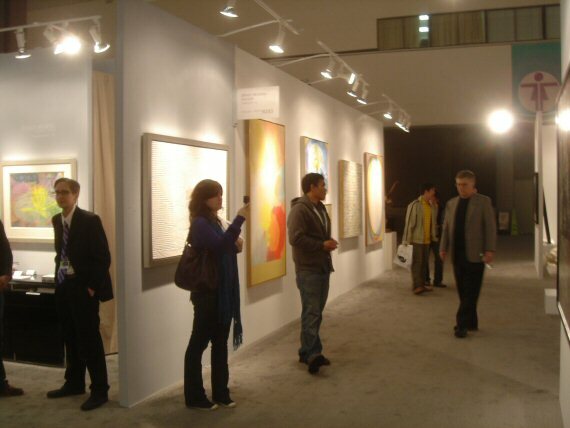 The multicolored painting in the center of the photo above is a painting by Howard Daum, whose work is better shown here (again from LewAllen). 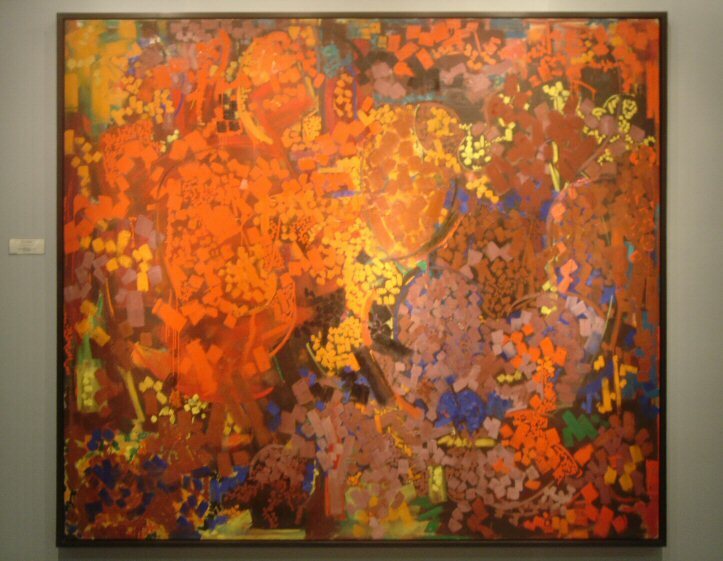 The painting above is “June“, 1978, oil on canvas, 48×65”, priced in the 5 figures. It was another of the paintings that really caught my eye at the show. I guess I’ve got champagne tastes when it comes to art. Overall it was a good show with a lot of very diverse art, from political Chinese art to California impressionists to emerging contemporary artists to old masters. (I saw a Picasso, several Chagalls, a Matisse, and a truly mediocre Monet.) I was encouraged to see all the out-of-state (not to mention out-of-country) galleries showing. I hope they made back their expenses (and then some), and I hope they’ll be back next year. I sure will. Entry filed under: Art Appreciation, Artists, Inspiration, LA Art Show, Shows. Thank you for the review, the pictures and the kind mention of my Blog. Hi! Great article …thanks for including us! Was wondering if you minded linking our name (Jonathan Novak Contemporary Art) to our website http://www.novakart.com in your post. Thank you!